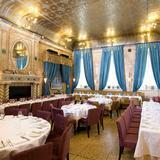 "The Criterion, situated in the heart of Piccadilly Circus, is an elegant and breathtakingly beautiful restaurant. Originally opened in 1874, the Grade II listed lavish space has undergone a gentle and sympathetic restoration of its spectacular interiors, adding warmth and softness to the space. Head Chef Artan Hasa, has created a Modern European menu that is simple and luxurious, and it is our aim to source the highest possible quality ingredients from within the British Isles. We are a member of the Sustainable Restaurant Association and are working with them to continually improve our sustainability. You can become part of history and walk in the footsteps of famous names and faces from TV, film, books and history. From the meeting point for Arthur Conan Doyle’s Sherlock Holmes and Doctor Watson to Downton Abbey’s Lady Edith means the Criterion echoes glamour and sophistication from a time gone by. Even The Suffragettes were known to regularly have afternoon tea and meetings at the Criterion as well as Winston Churchill also being a regular. In modern day the Criterion has been a backdrop to many films on the silver screen. If you are looking to feel like a knight for the day what better way than to do this than where Batman the dark knight rises was filmed. Other films include Rush, London boulevard, Madonna’s W.E and many more. Live music every Wednesday, Friday and Saturday night from 7.30pm, add to the charming ambience. 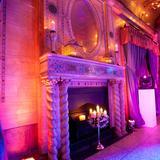 Come and discover this gem of history and timeless elegance for yourself." 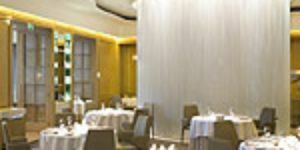 What did you think of Criterion Restaurant? The exquisite Criterion Restaurant is steeped in history; open since 1873 it boasts customers from the likes of Winston Churchill and the suffragettes, and can even boast being the imagined meeting place between the fictitious Dr. Watson and Sherlock Holmes in Sir Arthur Conan Doyle’s novel. Having famously changed hands a number of times to varied success, the restaurant can stand proud again, offering delectable dishes in a glorious setting. Criterion Restaurant is nothing if not one of the most romantic venues in London, and not something you’d expect to stumble into right in the epicentre of the tourism hub that is Piccadilly Circus. The grandeur and opulence of its neo-Byzantine design is quite something to behold. The elegant columns and timeless, beautiful arches are adorned with beautiful golden mosaics and the impressive long, golden bar is decorated with dramatic sprays of lilies that fill the bar area with a beautiful aroma. The restaurant area is scattered with round tables that leave plenty of room between each other for privacy, and a few steps leads you up to a raised area that boasts further velvet curtained arched windows, marble floors and more tables – a perfect place to hold an impressive private party or dinner. In fact, Criterion Restaurant is licensed for weddings, and would make an incredible setting for a 1920s style extravaganza. The entire restaurant has an air of grandeur and celebration – with prices like these there’s usually a special occasion for the customers. Although posh, the restaurant has a real relaxed feel and an air of diners really enjoying themselves. Miraculously, the clientele manages not to be showy Soho types and the restaurant isn’t too filled with tourists, unlike most restaurants in the area. Service is impeccable – waiting staff are both knowledgeable and friendly, and incredibly efficient to boot. Some evenings musicians grace the presence of the large grand piano to enhance the mood further, as they serenade diners with charming live performances. Although its reputation hasn’t always been the greatest when it comes to the food, Criterion Restaurant has really raised its game and serves some seriously impressive dishes cooked to perfection. The starter menu boasts the likes of red deer venison carpaccio with port jelly and baby beetroots, native lobster tortellini with lobster bisque, cauliflower puree, tomato concasse and celery cress, as well as dressed Colchester oysters with apple, samphire, lemon and mirin. The foie gras parfait with home cured goose breast, poached rhubarb, pain brioche and red currant is essentially one of the most perfect starters you’ll ever have the pleasure of savouring – ask for some more bread as the crisp melba toast just isn’t enough to spread the rich, perfectly balanced and beautifully presented flavours on. Coming in at between £8 and £11 a dish the starters aren’t cheap, but they’re worth it. Criterion Restaurant’s main dishes again are inventive with flavours and textures though once again costly, at between £16 and £32 per dish. Seafood lovers won’t fail to enjoy the homemade squid ink linguini with halibut, salmon, squid, prawns, mussels, chilli, garlic, cherry tomato and rocket, though the olive oil & vanilla poached ‘Peterhead’ cod with fondant potato looks equally as delicious. One of the best main dishes on the menu goes to the ‘fallow deer’ venison loin, served with parsnip puree, braised ‘Puy’ lentils, Savoy cabbage, redcurrants and, oddly, dark chocolate – an additional flavour that brings an incredible sweetness to the dish. However, the real triumph is what is essentially pork three ways; served on a slate is middle white pork loin, pork belly, pulled pork shoulder, black pudding and celeriac puree. Each different cut of meat is served differently and expertly and cooked to perfection – nicely accompanied by a side of creamed spinach. If you have any space for desserts, the ginger bread ‘French’ toast, served with chocolate and chestnut mousse, almonds, cherry jam and nougat ice cream is an absolute treat, and if you’re after a taste explosion in your mouth, hit up the cranberry & cream parfait with gorgeously salty caramel, walnuts, redcurrants and cinnamon ice cream. You won’t be disappointed. Luckily not quite as expensive as the dishes, Criterion Restaurant’s drinks list features cocktails from as far back as the 1800s – drinks that allegedly featured in the original cocktail book by the restaurant’s first ever bar tender. Expect excitingly named drinks such as ‘Midnight Cocktail’ and ‘Illusion Martini,’ with plenty of bases of Russian standard vodka and Mumbai gin. A pretty extensive spirits and liqueur menu offers an array of alcohol to dull the senses, and a delightful eight page wine list ensures plenty of choice when it comes to food pairing (ask your waitress or the sommelier for guidance). Criterion Restaurant has triumphed of late, with its breath-taking interior accompanied by impeccably presented and incredible tasting food combinations. A real winning combination – bravo. So glad you had a good time when you visited us this month. We're looking forward to welcoming you back soon. Went there last night to celebrate my birthday with family and had forgotten what a beautiful restaurant it was. The atmosphere, decor and, most importantly, ceiling are totally unique. The food was superb and reasonably priced considering you are in a top London restaurant. The service was excellent and all waiters and waitresses who served us were obliging, respectful and amiable. Not pretentious. I love the place, well worth a visit - it's one of a kind!! I never wrote a review before but I want to share my experience in Criterion with you guys. I went for afternoon tea this Sunday with a party of 9 at 3:30PM. Criterion is a beautiful place and the décor is STUNNING! We ordered all traditional tea and one with an apple juice instead as we had one child in our party. We didn’t wait long for the food and tea to arrive. The restaurant was not busy I think there were around 4 tables with customers. We had three finger sandwiches each, one VERY SMALL scone and a carrot cake, chocolate brownie and one cremebrulee for each person. The food was OK, nothing was great or amazing, the presentation of the food also needs improvement as every slice of cake is different sizes and so is the sandwiches with some has half of the crust on…..….But what annoyed me was once the waitress served the food I think she feels that is the end of her job. Soon most of our plates and teapots were empty so I called her over to ask her if we can have some more sandwiches and she said she had to check with the chef if that is ok?? I had high tea in many places and this is standard service and in fact always offered without even asking. Then I asked for her to fill out tea pot and asked if we could more scones. She looked like she was a little surprised and came back in 10mins to tell me that they have ran out of scones and it will take too long to remake another batch. Although she brought over more chocolate brownies but frankly by that time we have lost all our appetite. When the bill came I was so shocked they have charged me an extra 3 pounds for the apple juice with is was ordered instead of the tea?? I asked them to take it off the bill as I thought it was really unreasonable which they did but without apology. The tea in Criterion is 29 pounds per head but I would pay 34 pounds to go to Forum and Mason any day where you will really have a wonderful high tea experience. Seriously don’t bother with Criterion! Fantastic restaurant. Me and my husband ate here for his birthday and the service was excellent, the food was excellent and the atmosphere was excellent. We did end up spending a small fortune as we drank loads and did not want to leave. The piano player added to the fantastic atmosphere. We are planning another visit here again soon and we have decided to bring some friends. Hopefully they will pick up the tab! The Criterion is a beautiful place. It made our romantic night special. My other half surprised me with a restaurant and theatre date for our anniversary. I was totally taken aback by the beauty of the place absolutely amazing. Service was attentive and friendly without being intrusive. We sat two tables away from the piano player who also sang through our meal and added to the great warm atmosphere. The food was soooo tasty. I had the duck eggs Benedict to start with, salmon and fondant potato finished with a tiramisu. My other half went for chicken liver pate, pork chops and then a choc tart, ice-cream with blood orange preserve and raspberry sauce. The food was perfectly portioned and I have to say the choc dessert won it for me... I had to fight myself from stealing it. All in all perfect night with me feeling very happy and full indeed :o). Shame about the waiter who didn't know the menu, asked for Oysters, he said there wasn't any. It is on the online menu and when I went to the toilet, there was a party of 4 eating two dozens of Oysters! He seemed to be in a hurry and rushed us the whole evening. Starter was fantastic, mains beautifully presented and tasty, but slightly cold. Not somebody who moans normally, but for the price, I would have expected a bit more, it was supposed to be a birthday treat. The service was great, waiters were polite. The food was mediocre. The portion sizes were too small. I couldn't even see or taste some of the ingredients that were stated on the menu. Its such a pretentious place that I felt uncomfortable to send the food back so just paid and left. Wouldn't recommend it to anybody. The Criterion is all about the mosaic ceiling and piano player...they forgot about the food. I went last weekend and it was a fantastic night. The food quality in this place has really changed since I went a year ago. The smoked fish was really tasty and the fillet steak was out of this world! We shared the raspberry and mousse with dark chocolate which satisfied my sweet craving and left us full to bursting. Staff are friendly and smiley and the piano player / singer is a nice touch and really lifts the atmosphere. I've already booked again to take my parents as a Christmas treat! A few friend and I went out wanting a quick meal while we could not leave this outstanding restaurant as we all fell in love with the food. we must of samples everything on the menu. The desserts were wonderful with a real modern presentation. I was having a romantic dinner in the most beautiful building with my partner... the best place is The Criterion. Marvellous food, excellent professional service and amazing pianist. Definitely recommend! Criterion, since it was re-opened, has really gone upmarket and busy. Food is absolutely superb, as well as service and buzzy atmosphere even on a Wednesday night. Definitely recommend it to anyone that has not been there! 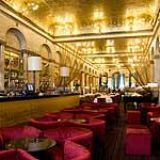 I recently dined at the Criterion, which has always been a favourite of mine but have not dined there for about a year. I had heard that it was no longer a Marco Pierre White venue so I was certainly intrigued, and very pleasantly surprised. 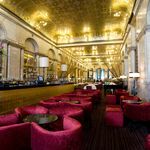 It is now under new management and has under-gone a small refurbishment, but it still has it's stunning gold leaf mosaic ceiling and marbles walls which sparkle on arrival. The food is now no longer a heavy french affair but a very tempting Modern menu with dishes such as a selection of UK Oysters, Fillet of Ostrich and Pork cooked three ways, and all accompanied by homemade bread and butter. Well worth the money and the service was immpeccable, with smiling and extremely helpful staff with nothing too much trouble for them. Very reasonably priced and with the Menu du Jour from £18.00 for 2 courses you cannot go wrong! 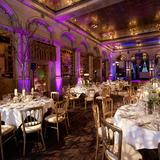 I shall be certainly recommending friends and family to this stunning London venue. 92 destinations curated by View .